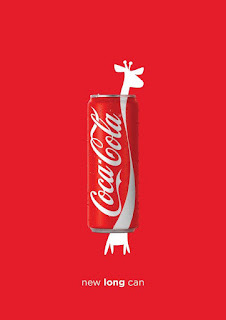 Tarek Chemaly: Coca-Cola giraffe - a bit late, I know! Coca-Cola giraffe - a bit late, I know! Ooops, this one flew totally under the radar - and it took an international advertising website to reveal it to me! By now we are all familiar with the elongated can shape of Coca-Cola but it is nice to see someone do something creative about. It does date back to 2016 but then again I never saw the ad anywhere displayed in Lebanon. Oh and it's totally cute!